In our legs we have 2 sets of veins, superficial on the outside of the legs and deep, which are buried deep within our muscles. Blood generally flows from the superficial system to the deep system and then onward to the heart to be pumped back again. There are 2 superficial systems, one drains into the deep veins in the groin and one drains into the veins behind the knee. This means the blood has to travel up against gravity. This is facilitated by the muscles in our legs which work as pumps to push the blood up. The valves within the veins stop the blood gushing back down. Varicose veins are dilated tortuous veins, which usually occur in the legs. They can vary in size from 0.5cms to sometimes what looks like a bunch of grapes many centimetres across. They usually have blue tinge to them although they can turn darker. They are prevalent in almost 20-30% of the adult population. Although they are thought to be more common in women than men the difference is not that stark (5:3). They usually initially appear in the 30’s although they can present at any age. Patients can often present very late, having had them for many years. Varicose veins often run in families although a specific cause has not been found. They can often appear in pregnancy, or become more prominent or symptomatic in pregnancy. Varicose veins develop when the valves within the veins no longer work. The valves start to leak which allows the blood to flow backwards and pool within the veins. The vein wall weakens due to these changes, causing the wall to become ‘baggy’. 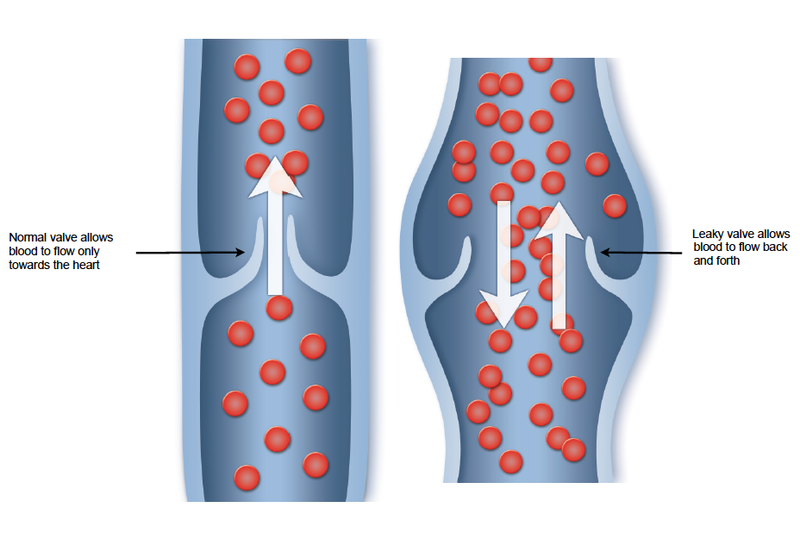 Because of the pooling of blood, there is increased pressure in the lower half of the vein i.e. near the ankle, which is responsible for a lot of the symptoms and complications. Varicose veins can present with a number of symptoms. Their prominence and visibility is what most people notice initially. Over time they can lead to heaviness, aching and itching of the legs, particularly at the end of the day and particularly if you are on your feet all day. Sometimes the symptoms can be more subtle such as restless legs, tiredness in the legs and also swelling. The severity of the symptoms may not relate to the extent of the visible veins. For example, if the leg is swollen the varicose veins may not be so prominent. If you develop complications the symptoms can get worse such as pain over the veins themselves, especially if you develop phlebitis. Over time the skin around your ankle can get darker and pigmented and the itching can be constant. In worst cases you can develop ulcers. Once varicose veins have developed they do not go away without treatment. However, in a large number, the veins may not cause you any symptoms and hence can be left alone. They do tend to get more prominent over time, usually years. Once you start developing symptoms they tend to get worse over time. Studies suggest that 1 in 10 patients develop worsening symptoms such as swelling and skin changes. Once you develop swelling there is an increased risk of skin changes and once you develop skin changes they is an increased risk of ulceration. Skin changes are usually permanent and cannot be reversed. Complications include oedema (lower limb swelling), varicose eczema, pigmentation (brown discolouration) of the skin, bleeding, thrombophlebitis (inflammation within the vein wall) and ulceration. These usually occur when the varicose veins have been there for decades. Unfortunately this can mean they occur later in life, when surgery and anaesthesia may present greater risks. However, in some cases, they can occur earlier. For example, thrombophlebitis can occur commonly on pregnancy. Similarly, if there is a cut or an injury over the vein it, can bleed profusely. Venous ulcers develop due to skin changes and damage to the skin, usually above the ankle. This presents in patients with a history of varicose veins and/or deep vein thrombosis. Although they are not common they can be very troublesome and can take a long time to heal. They can also come back. They are usually treated with compression dressing until they are healed. Patients who have developed venous ulcers should have their veins treated if suitable, to reduce the risk of further ulcers. 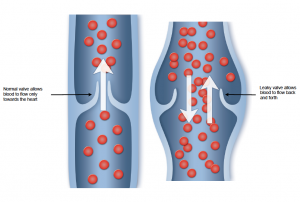 Deep vein thrombosis is a blood clot in one of the deep veins in the body. They can occur in many different circumstances such as when you are laid up in bed, especially after major surgery or trauma. Major joint surgery, such as hip and knee, also increase the risk. Very rarely they can occur after long haul flights. Varicose veins very rarely predispose to DVT in the legs but DVT in the legs can secondarily cause varicose veins. They can be prevented by various measures, such as making sure you are well hydrated, wearing compression stockings and taking blood-thinning medication. If you have had a DVT then you will be treated with blood thinners such as heparin and warfarin. You will be asked to wear compression stockings. Compression stockings are classified based on the amount of pressure they exert at the ankle. The pressure is gradated, being highest at the ankle and decreasing up the calf and leg. They can be above or below-knee stockings. Ideally you should wear above knee stockings but it is accepted that they very uncomfortable and have a tendency to roll down. Hence it is probably preferable to wear below-knee stockings. We will recommend the class of stocking you should wear. The stockings work by preventing fluid from accumulating in the leg. This in turn reduces the risk of complications, especially ulcers. If you have had previous venous ulcers we would strongly recommend that you wear them. It is however very important you don’t wear compression stockings without seeking medical advice first. It is important to ensure your arteries are healthy before wearing compression stockings. Compression stockings can be acquired with an NHS prescription through your GP. You can also buy them privately through a number of web-based companies.